Are you wondering what the best RV air conditioner is? In today's guide, we reveal the 5 best RV AC units on the market. But that's not all! We also discuss whether you even need a new air conditioner and answer some commonly asked questions. Is Your New RV Air Conditioner Easy to Install (How Heavy Is It)? Do You Need A New RV Air Conditioner? Q - Can I heat my RV with the air conditioning unit as well? Q - Do I need someone to install my RV air conditioner or can I do it myself? Q - How often should you maintenance your RV air conditioner? Q - What’s the difference between a non-ducted and ducted installation? Q - Am I able to run my RV air conditioner on battery power? Just want the best of the best and don't feel like reading? Our advice when choosing an RC AC unit? Pick one with a sleek, aerodynamic shape. This way, your AC unit will be shaped to resist wind drag which helps your vehicle from being slowed down in severe weather and increases fuel efficiency, too! BTUs (also known as British Thermal Units) may very well be the main driving factor when it comes to choosing your new RV air conditioner. Simply put, BTUs are defined as the amount of heat required to raise the temperature of one pound of water by one degree Fahrenheit. One BTU is about 1055 joules (derived unit of energy). Depending on how many BTUs you have helps you figure out how well your AC will cool your space. If you’re frequently traveling in humid/hot places, you’ll want a unit with no less than 13,500 BTUs. Some RVs only have one AC unit inside of them and, while this is okay most of the time, it can be a pain to cool the entire RV (especially if your RV is set up on asphalt or was built with metal panels). A larger RV may need an AC unit with 18,000 BTUs or more to cool your rig. Scenario one: So, your rig desperately needs a new AC unit. You’ve found one that’ll do the job but can barely lift it yourself and really don’t have anyone to help you install it. Not to mention, the instructions look like gibberish. Should you still purchase it? That depends; are you going to have someone install it for you? Clearly, you don’t want to throw your back out just to put a new AC in your rig (and you don’t want to feel like you’re unable to follow the directions). There are plenty of AC units that are slim and lightweight - you just have to do some more digging to find the perfect one (which we’re hoping to help you with in this guide)! Scenario two (or, as we like to call it, the better scenario): You found a lightweight RV air conditioner, it’s the updated make/model of the one you currently have, and you’re feeling confident in your abilities. You take a look at the instructions and, to your surprise, you understand every single thing they’re saying and you’re able to put it together. Moral to the two stories? If you think you can install your new RV air conditioner, do it. If it’s easy, it’s easy. If not, well… you know the answer already. Before we talk about the top 5 air conditioners for 2018, we thought we’d share a checklist with you to see if you even need a new RV air conditioner! 1. Is your RV air conditioner slow to start? If so, does the air blow weaker than normal or blow warm air? In some cases, this means you need to replace your capacitors. In others, it means your AC unit needs to be replaced. 2. Does your RV air conditioner only work when set to certain speeds? This may mean the fan motor needs to be replaced - however, it could also mean your AC unit is slowly going downhill. 3. Has your RV air conditioning unit been leaking? You might have a leaky gasket that needs replacing! When this happens, the bolts attached to the AC unit may loosen and, in some cases, start to rust. 5. Is your RV air conditioning unit noisy? There could be something trapped in the motor! If not, you may need a newer model. Without further ado, let’s talk about RV air conditioning units to consider when looking for a new one! before we purchase something new for our RV. It’s always a good idea to get a second opinion, though! Known as one of the best RV air conditioning units to date, the Coleman Mach 15+ is highly recommended by the RV community because of how powerful (and durable) it is. It features a 1/3-hp fan motor (the biggest motor used in RV air conditioners to date)and can provide cool air at 325 CFM (cubic feet per minute). Side Note: You’re able to add the optional heater assembly to have 5,600 BTUs of heat for cool-weather outings, too! If you’re looking for something sturdy, lightweight, and durable, the Dometic Brisk II AC may be your best bet. This unit is highly recommended because it’s compact, inexpensive, aerodynamic, and versatile. 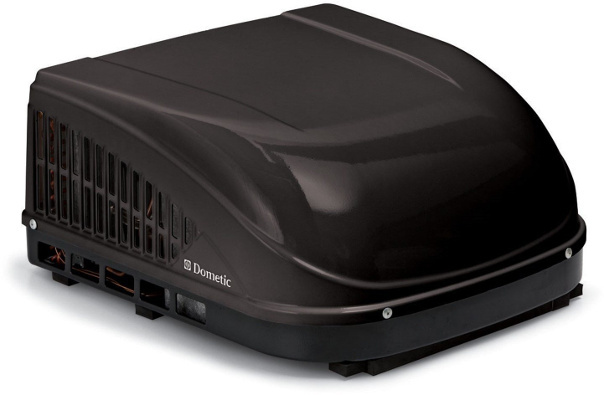 The Dometic Brisk II AC almost beat the Coleman Mach 15+ for the first spot, but fell short by just a few points. The Atwood 15026 non-ducted AC unit was designed to withstand harsh weather and, one of my favorite things about this model, it comes equipped with a heat pump so you can also get heat in cool climates without buying anything extra. One of the main reasons this AC unit is recommended is because it’s known to be able to cool down your RV quickly (without consuming too much power). 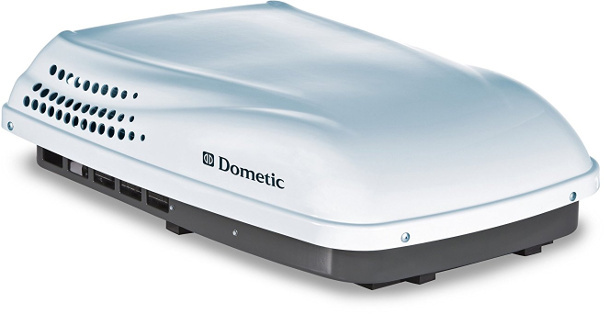 The Dometic Penguin II has an ultra-low profile while also featuring a futuristic streamlined design. The high-performance motor and fan deliver powerful cooling performance using a more eco-friendly R410A refrigerant. ...Dometic has been assisting NASA with their air conditioning needs since 2011! need the Multi-Zone CCC II thermostat to use this in your RV. The Coleman Mach 3+ has a solid 13,500 BTU cooling capacity. It’s built with all-copper tubing and has gas-flux brazed joints which ensure durability (as well as a long lifespan for your RV AC). If you choose to add the optional heater assembly, you'll have 5,600 BTUs of heat for cool-weather outings, too! You’re able to get the Coleman Mach 3+ in white or black; just make sure you have someone to help you install this model. "Awesome easy to install unit. Took about an hour to install and blows ice cold air. 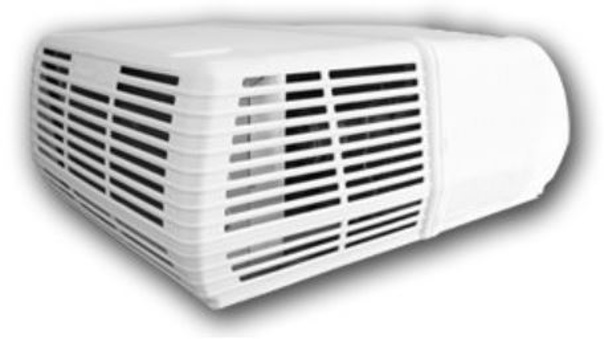 If you're in the market for a replacement AC unit for your RV, go with this one." We’re almost to the end of this guide! Before you go, we wanted to share with you five frequently asked questions when it comes to RV air conditioning units. A - Unfortunately, you’re unable to heat your RV with your air conditioning unit unless you purchase heat strips (or heater assembly kits for certain RV air conditioners) that can be equipped to your RVs AC - both non-ducted and ducted (more on that in a minute). Before purchasing either of these heat strips, you need to know if your RVs AC unit is ducted or non-ducted. These tools are not “one size fits all". A - This really depends on how skilled/comfortable you are manually installing something like this. If you’re confident in your abilities and don’t think you’ll harm your RV rooftop, by all means go for it! If you feel a little nervous, maybe leave this one to the professionals. A - As a general rule of thumb, you should check your AC unit frequently (such as every two months) to see if there are cracks and/or splits in the plastic. This is a common side effect of wear and tear and, if not taken care of, can damage your AC unit beyond repair. Keep in mind, too, that the sun's UV rays (and harsh weather) can weaken the AC unit on the rooftop. You don’t want to be stuck with a broken AC unit when you’re traveling in your RV (even for a day or two). 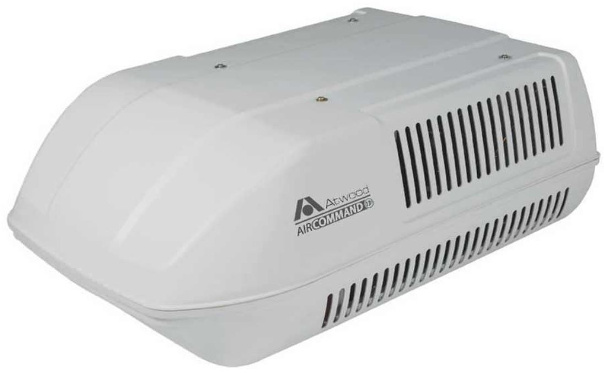 A - When working with a ducted installation, the roof unit connects to ducts inside your RV that distribute the air. With this method, you’re able to control the settings with a remote or wall thermostat. You’ll also usually have an air distribution box (ADB) between the AC and the ducts. A non-ducted installation is usually more simple - your AC is literally sucking air from the roof and blowing it out the bottom of the unit (from the ceiling). You’re usually equipped with a control unit that allows you to set the temperature in your RV. A - You can… if you’re willing to do a bit of work first. We’re talking full on solar panels, generators, or extra batteries. Because Bill and I have never done this ourselves, we’ll let our friends over at Technomadia do the talking for this one. 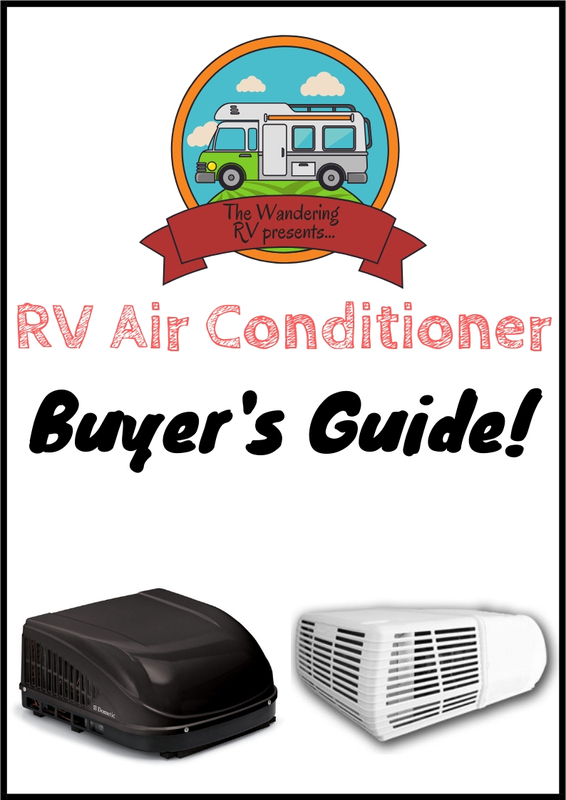 You now know how to choose the best RV air conditioner! In our opinion, if you want the best of the best, go with the Coleman Mach 15+. It has the ideal combination of efficiency and affordability. If you have any other questions about your AC unit that we didn’t answer here, drop a comment below - we answer every one!